Here’s a new high school humor that will surely get everyone in our alumni community talking. While the creator chooses to remain anonymous saying she claims it is a creative outlet for the inspiration she get from her high school memories. 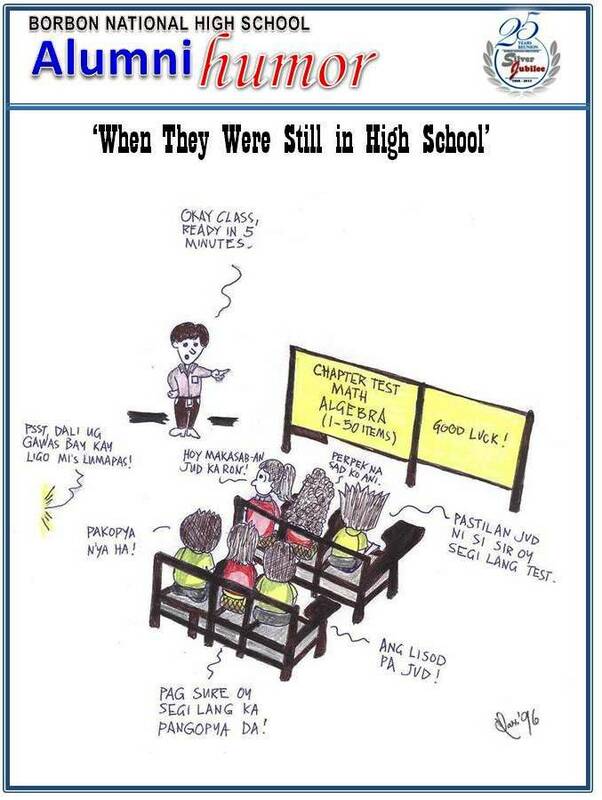 It’s a cute illustration of how a couple of alumni (read as Batch 1996) may have been like inside the math class of Mr. Math Wizard. The creator wants to portray a cherished moment in her high school days, a Math topic that until now she has hard time reconciling hehehe — it’s about High school Algebra. The illustration shows some humor in it, an alumna looking outside the classroom, getting annoyed as she hears someone inviting a friend to sneak out for a swimming spree in Lumapas Beach. A ‘serious’ student showing confidence to get a perfect score; while her seatmate’s getting irritated for the test. Another asking a seatmate if he could have a glimpse on her answer; while the seatmate rebuffing on the classmate’s irritating habit and one that simply shows clear objection on the topic (the creator herself, hahaha).